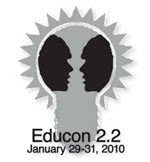 Burlington High School Principal's Blog: Weekend Plans - I'm Going To Educon! Weekend Plans - I'm Going To Educon! I can't remember the last time that I was this excited about a conference. I am literally minutes away from heading out on a road trip to Educon with @ericconti and @baldy7 (those are their Twitter names). Both are bloggers and educators who share a progressive philosophy about what we need to be doing in our public schools. You should check out their blogs when you have a moment. Here is a link to Eric's Blog and here's a link to Tony's. EduCon 2.2 is both a conversation and a conference. Stay tuned here for more. I haven't told my travel companions yet that I want to film some of our road trip to share the conversations along the way. I am hoping that this will allow us to escalate the engagement level of everyone involved in the BHS community as we continue to make our school the best it can be for the students of Burlington.